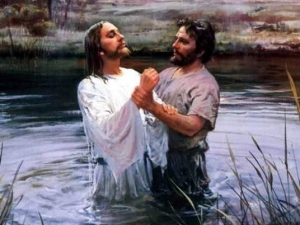 The baptism of Jesus by John is a key moment. Jesus is named by God as Servant, Messiah and Son of God. 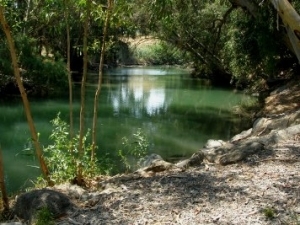 John the Baptist was a well-known teacher in Galilee. then in a ceremony which literally washed them clean in the River Jordan. This ceremony was a symbolic replaying of the Exodus from Egypt, where the people crossed the Jordan into the Promised Land. Jesus would certainly have heard of John and listened to his teachings. Now he approached the spot on the river bank where John taught, and offered himself as a candidate for the cleansing ritual, the baptism. John reacted with surprise. Jesus and his teachings. In any event, he saw that this was no sinner in need of repentance, and he said so, emphatically. He pointed out that it was he who should have been coming to Jesus for baptism, not the other way round. 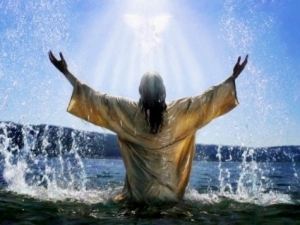 He also called Jesus the ‘Lamb of God’, an extraordinary thing to do, and said that instead of having his sins taken away by baptism, Jesus would be the one who took away the sins of the whole world. John saw no point in baptising such a person. 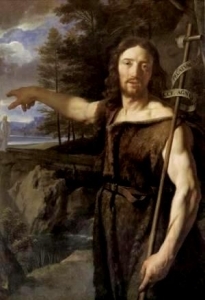 Photograph of the Jordan RiverJesus calmly corrected him. He wished to be baptised, and it was fitting that John should be the baptiser. John immediately gave in, acknowledging that it was Jesus who had authority, not him. The people who witnessed this extraordinary scene must have been astonished, but it was only a prelude for what followed. All four gospels agree on what happened next. This was the moment when John realized who Jesus was. A dove or white bird hovering above, with blue sky As Jesus came up out of the water (the same word is used when describing the Exodus and the entry into the Promised Land), the heavens opened – the original Greek word means something like ‘torn or ripped asunder’, so that those below had a glimpse of heaven. Remember that at the time the gospels were written, people believed that the sky was a dome that covered a flat disc, the earth. 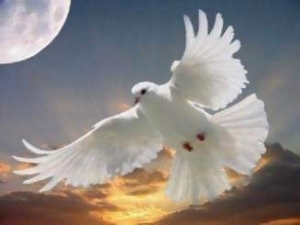 In the form of a dove, God reached down into the world of Jesus. People could see it happening: God ‘in bodily form’. The gospel writers wanted their readers to remember the dove in Genesis, hovering over the dark waters of the Deluge, bringing hope to those trapped in the Ark below. Then God’s voice was heard. He called Jesus ‘Beloved Son’, words that signalled a unique relationship between the two, Father and Son. Because of what happened that day, John and the people around him realized who Jesus was, and the work he had come to do. 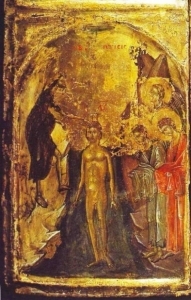 A most unusual icon dated at about 1300AD, showing Jesus stripped of all clothing as he moves down into the waters of the Jordan to receive his baptism at the hands of John the Baptist. This is part of a four-piece panel showing the Annunciation, the Nativity, the Baptism of Christ and the Transfiguration, four of the major events in the cycle of the Christian Church’s year. 14 John would have prevented him, saying, “I need to be baptized by you, and do you come to me?” 15 But Jesus answered him, “Let it be so now; for thus it is fitting for us to fulfil all righteousness.” Then he consented.